This year, we've decided to ask our staff what they'd like to receive as presents and tell us why. There are also suggestions based on things we already have and think no one should live without. So if you have someone active in your life and don't quite know what to give her, or if you are looking for suggestions for yourself, take a few minutes to read through this list, you might get inspired! The Edelrid Mega Jul is my favourite belay device. Simple to use, safe and long lasting because of the stainless steel construction. For the coffee aficionado in your life. The Aeropress makes the best coffee and can be used anywhere from the kitchen to the backcountry. Plus, it is so easy to clean, you can just wipe it down, no water necessary. In fact, we got it for camping, and it wasn't long before it replaced our espresso machine... Yes, it's that good! Ortovox Merino baselayers are super soft and comfortable, they keep you warm and have fun colours to choose from. Garmin InReach Mini is a must for anybody who ventures in the backcountry. With its small design and light weight, there is no more excuses not to have an emergency device. Don't be fooled by their look, the Hoka Flip flops are like walking on air! Great to have so you can give your toes a break between climbs at the gym or crag. The Magnetron RockLock carabiner has a super versatile shape for various uses, long wearing due to the round-stock construction, and has the added safety and ease of use that the magnetic auto-lock system offers. Cams can make a great gift for the climber in your life. As most of us are building a rack or replacing tired old equipment it will surely be a welcomed gift. 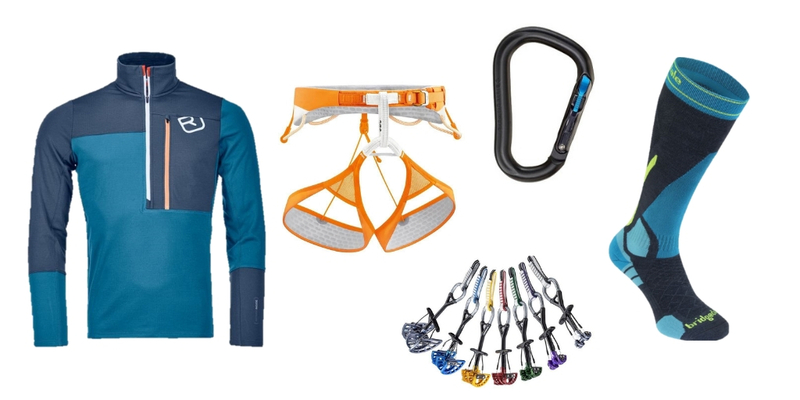 The Petzl Sitta harness should be one of those wish list items for most people looking to cut down on weight and bulk in their ice or alpine kit without compromise. Merino wool is a mountain luxury, whether it's a soft cozy hoody, or a set of glove liners that keep your hands warm even when wet. Ortovox base layers and Bridgedale socks that won’t clear a room after a big day out, and tuques to keep jack frost from nipping at your ears. The choices are endless, but the result is the same; comfort. The BCA Tracker 2 is a lightning fast avalanche transceiver that offers ease of use even in the most stressful of situations, this classic device delivers info to the user very quickly, which with practice will allow the user to move quickly while searching for a victim. 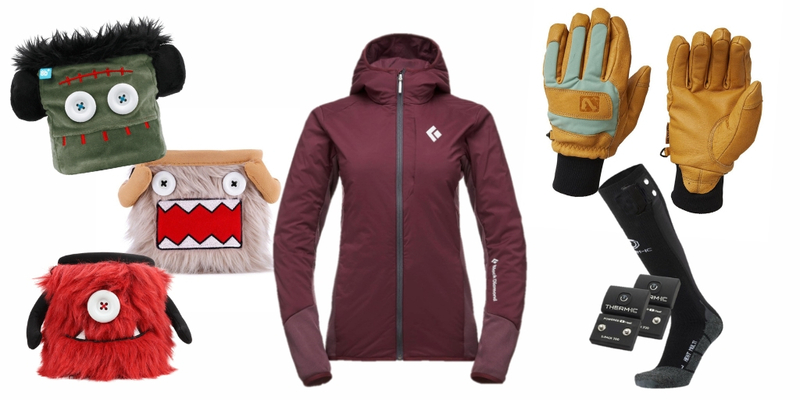 Are you a non-climber but have to buy a gift for a climber? Does all the different types of gear confuse you? Are you not sure if they have it already? Lucky for you, 60 cm slings are something every climber can never have enough of. The core concept of climbing is keeping things attached together, and slings excels at that. 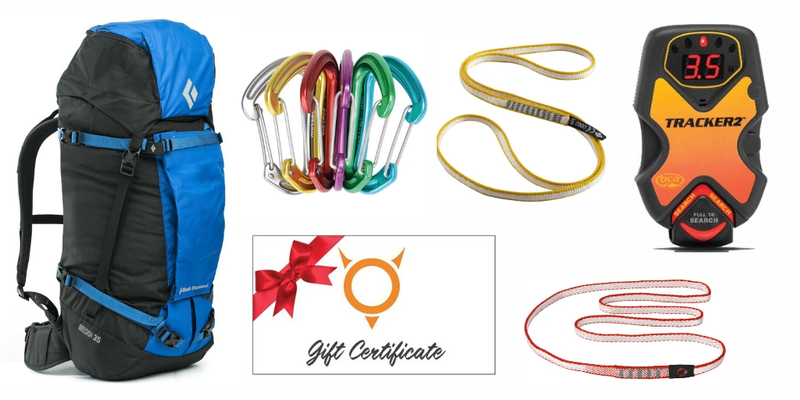 Combine slings with several non-locking carabiners for the gift that any climber will have use for. The Black Diamond Mission 35 is a great backpack for those who need a pack that does everything and carry loads well. Its suspension system is more supportive than other bags in its class, this is a great feature for those longer days. 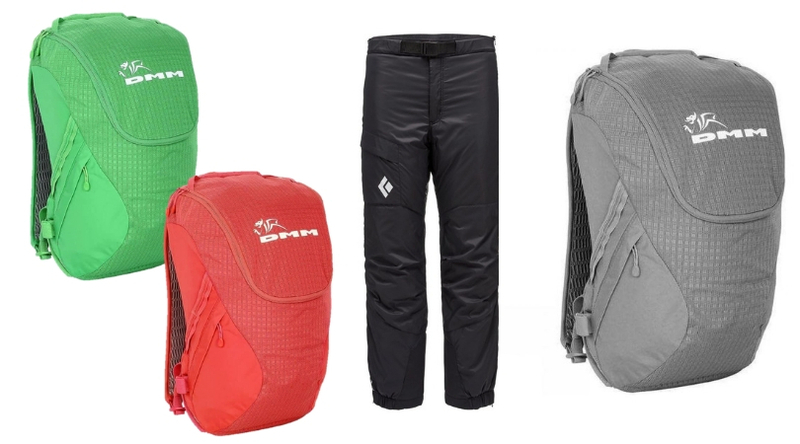 Its technical features lend itself well to alpine and ice climbing but this do-it-all pack can handle everything from hiking to backcountry skiing. Let's face it, some people are easier to buy gifts for than others. For that special someone who has everything, and isn't exactly open with their Christmas list, a Vertical Addiction gift card is a great way to set them up with high-quality equipment, without all the guesswork. With our vast array of products, a Vertical Addiction gift card is the gift that truly keeps on giving. The Aeropress makes great coffee and is easy to clean without water. Obviously, your best friend when camping. Another classic on long camping trips, the Moji charging station by Black Diamond is a lantern that can also be used to charge your phone. It is bright enough to prepare dinner in the dark or can be dimmed to use as a reading lamp in the tent. Simply because everyone enjoy the warmth and cushy feeling of a brand new pair of quality socks, the Bridgedale socks are a great gift. 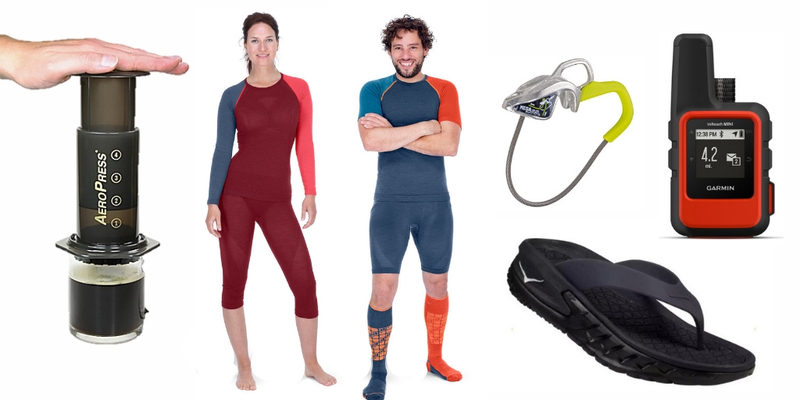 Made from Merino Wool blend, you can choose between ski socks, hiking socks or running socks. Flylow beanies are the perfect stocking stuffer! They come in great styles and colors and as we all know, one can never have too many beanies when living in Canmore! Winter equals the perfect time to train for the next climbing season! The Beastmakers hangboards are ideal for training at home, has a variety of hold types and the wood won’t destroy your skin! The Squamish bouldering guidebook is well organised and well illustrated and provides the perfect motivation to train over winter! The Black Diamond Forearm Trainer is another stuffer for the stocking! Get pumped while watching Netflix of warm up those muscles on the walk into your favourite crag next summer! If you're like me, chalk bags tend to disappear all the time! The 8B Plus Monster Chalkbags are cute chalk bags that will put a smile on everyone's face. Pair it with a chalk ball and you have yourself a thoughtful present. We all know that person who's always cold in winter. Whether skiing, ice climbing or just walking around town, the Therm-ic socks or soles are an awesome gift to receive when you always have cold feet. With these heating socks, you will never have to suffer through not feeling your toes ever again! If you a looking for a good, durable leather glove at a great price point, the Flylow Magarac gloves are stylish, warm and pre-treated. And, they come in 4 different colours! The Black Diamond First Light Hybrid Hoody is definitely a jacket I would love to receive for Christmas. It is a great mid-layer with Primaloft insulation in the front and Merino Wool in the back. It would be a great piece to use backcountry skiing and even when hiking in the fall or on cold summer early starts. The insulated front protects you from cold wind but the Merino Wool back allow you to carry a backpack without overheating. Like walking around wearing a sleeping bag, the super cozy Black Diamond Stance Belay Pants turn bone chilling belays into a warm, pleasant affair. Not just for ice climbers, these are perfect for shoulder season rock climbing or just for keeping in your car in case of emergency. The DMM Zenith 18 Pack is the perfect multi-pitch climbing pack. The right size to hold all essential multi-pitch climbing equipment, gear loops to stay organized and an ergonomic shape that moves with you while you climb. I love the bucket style opening when clipped to anchors. This is a great way to spoil the climber in your life. With the Beastmakers Hangboards, you'll get stronger, faster and without the wear and tear on your skin. Walk with the ease of a running shoe and throw down with the stiffness and performance of freestyle boot with the all-new Dynafit Hoji ProTour ski boot. 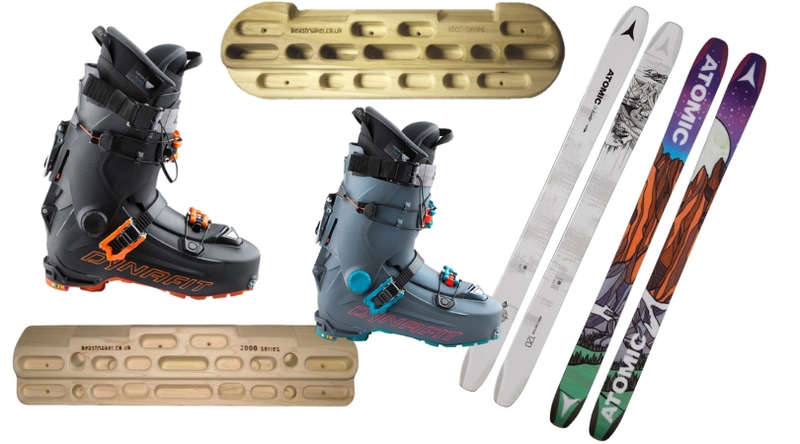 It has one of the easiest, most efficient walk mode ever integrated into a ski boot. If you’re looking for one all around pow ski to add to your quiver, picking a pair of the buttery and playful chet 120’s shouldn’t even be a question. From floating through the pow fields to stopping down your 50ft pillow lines, these guys will make that experience that much better. Hopefully, this will help with your Holiday shopping and if you feel you need more info on products or other suggestions, feel free to leave a comment, stop by the store or send us an email or a message on Facebook and we can chat further.